Holyoke’s Brain Bowl tournament exceeded expectations this past Monday! With five schools in attendance, including Akron, Burlington, Wray, and Yuma, everyone had a great time as they raced to answer a plethora of general knowledge questions correctly. The Holyoke High School A team placed 3rd. Team members included Luke Krogmeier, Kayla Marshall, Morgan Philips, Maddy Beckner, Sylvia McCleary, and Ty Lamm. The Holyoke Junior High A team placed 2nd with Ashlyn Marcum, Ashley Aranda, and Diego Jimenez competing. Junior High B team placed 1st. 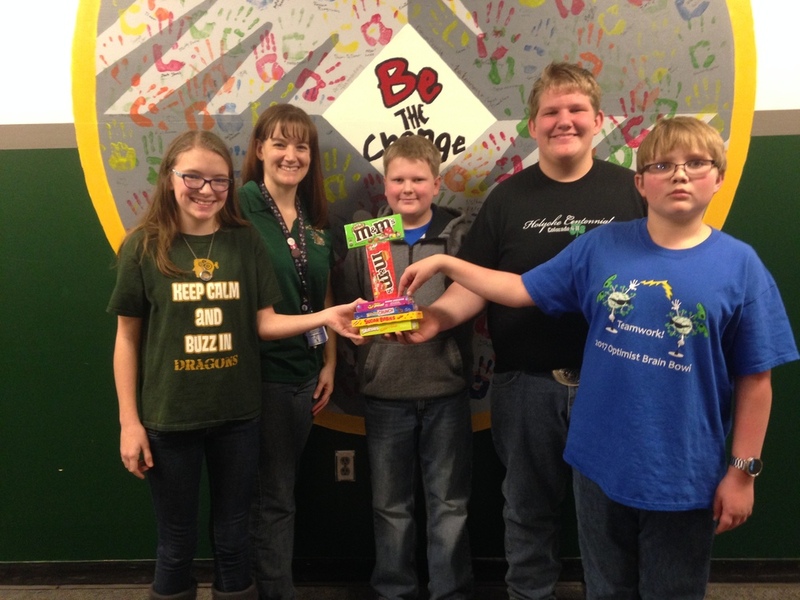 That team is pictured above, from left to right: Miranda Schroetlin, coach Mrs. Schroetlin, Tuff Sigler, Baylor Struckmeyer, and Tristen Ferguson. Great job Dragons!